We're six months into our Saving Lives at Birth project. Here's an update on our progress. In 2017, Gradian Health Systems was awarded a grant from Saving Lives at Birth—a partnership among USAID, DFID, Grand Challenges Canada, KOICA, Norad, & the Bill and Melinda Gates Foundation—for a project to reduce maternal and newborn deaths in Zambia. 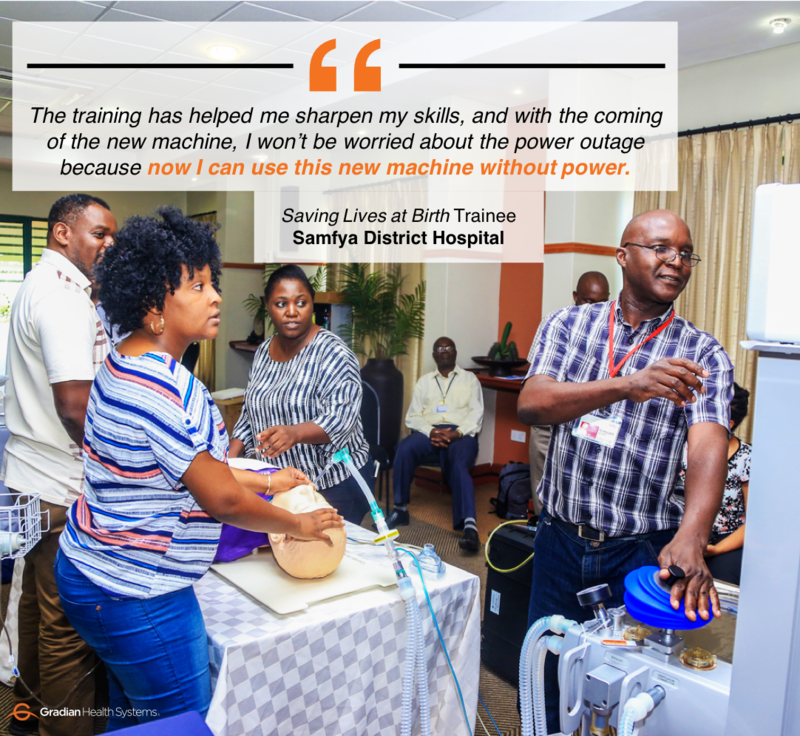 The project combines Gradian’s anesthesia technology with intensive local training courses to strengthen Zambia’s capacity to deliver anesthesia during emergency childbirth procedures, such as C-section surgery. 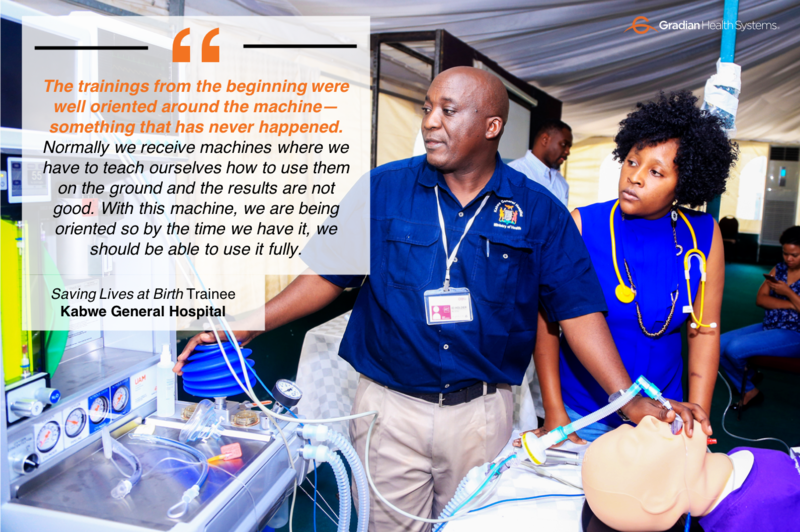 Designed in collaboration with the Ministry of Health and a team of leading Zambian healthcare organizations, the Saving Lives at Birth project represents one of the Government’s inaugural efforts to implement its new National Surgical, Obstetric & Anesthesia Strategic Plan (NSOASP). To kick off the project, Gradian gathered all of our local partners for a technical workshop on planning and implementation. Leaders from each organization were present, including CHAZ's Executive Director and key representatives of Zambia’s Ministry of Health (MOH). The meeting offered each of the partners a chance to discuss their roles, expectations, concerns, and goals of the project, yielding a fruitful set of insights and commentaries that have already begun to shape our activities. After designing a monitoring and evaluation (M&E) plan and securing authorization from the Permanent Secretary of Zambia's MOH, Gradian and a team of seven Zambian data collectors set out to conduct on-site assessments at each of the 32 hospitals receiving a UAM. We captured specific qualitative and quantitative details that will serve as the project's baseline dataset against which we will measure our impact on maternal and newborn healthcare—looking at changes in the availability of *functional* medical equipment, C-section rates, referrals, patient volume, provider confidence, and a host of other important metrics. Put simply: We want to know how quality anesthesia technology and training affects childbirth and surgical outcomes in Zambia; and we've assembled the team and the tools to find out. Here's what we know so far across the 32 hospitals we assessed: C-sections are the most common type of surgery, and as a result, girls and women age 15-49 are the most common surgical patient. In terms of service provision, we learned that the main barriers to safe anesthesia are an absence of functional equipment, insufficient provider training, and infrastructure challenges such as power outages and oxygen shortages. Perhaps most notable, however, was the status of human resources able to care for patients: most hospitals have staff shortages and very few have doctors to provide anesthesia—relying instead on nurses and clinical officers. Almost none have a trained biomedical equipment technician (BMET) on-site to maintain and repair medical equipment. We hosted a certification program for three BMETs at Sonergy, which was held at our technical training center in Nairobi. Led by our lead biomedical engineer in Kenya and experienced UAM BMETs, the course ensured that Sonergy’s field staff--stationed throughout Zambia--were well-versed on all technical components of the UAM so they could service our equipment and train local BMETs to maintain it. 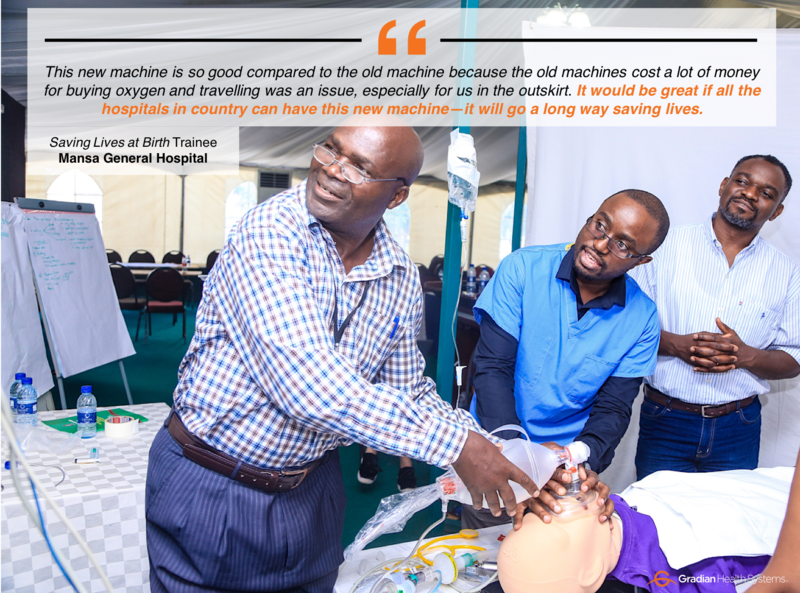 We have a long way to go in our effort to strengthen biomedical capacity throughout the country, but now 32 Zambian hospitals have access to in-country experts certified to keep their anesthesia equipment reliable and effective. Our project's clinical capacity building effort started with two train-the-trainers courses: one for national training leads and the other for those trainers to train the other members of their team. The first course was held at our anesthesia simulation lab at Kilimanjaro Christian Medical Center (KCMC) in Tanzania, where two anesthesiologists from SAZ underwent a weeklong, simulation-based certification course. Upon returning to Lusaka, these newly-certified trainers led their colleagues through the course, establishing a national training team of seven doctors and nurses. During the week of 19 March, Gradian, SAZ, CHAZ, Sonergy, and Chainama organized and hosted a centralized clinical skills training for 41 anesthesia providers from project hospitals. The first three days of the training were devoted to the Safer Anesthesia from Education (SAFE) Pediatrics curriculum: an internationally-validated course developed by the World Federation of Societies of Anesthesiologists (WFSA) and the Association of Anesthesiologists of Great Britain and Ireland (AAGBI). Led by SAZ, the course was structured as a refresher training for non-physician anesthesia providers, with lectures, interactive modules, and low-fidelity simulations that covered a range of clinical techniques for providing anesthesia to children and newborns. The next two days were focused on the UAM and its newest users: 11 anesthesia providers from the first handful of hospitals receiving the machine. Our Saving Lives at Birth clinical training team coached each provider through an intensive UAM product training that used simulation manikins and scenarios to replicate a range of circumstances that users might face when delivering anesthesia. This set of simulation trainings produced a new cadre of UAM users able to safely and confidently operate the machine with refined skills in pediatric anesthesia. First, we manufactured the initial batch of UAMs and shipped them to Zambia, where CHAZ and Sonergy teamed up to import, clear, and store them in Lusaka and eventually distribute them to each Year 1 facility. 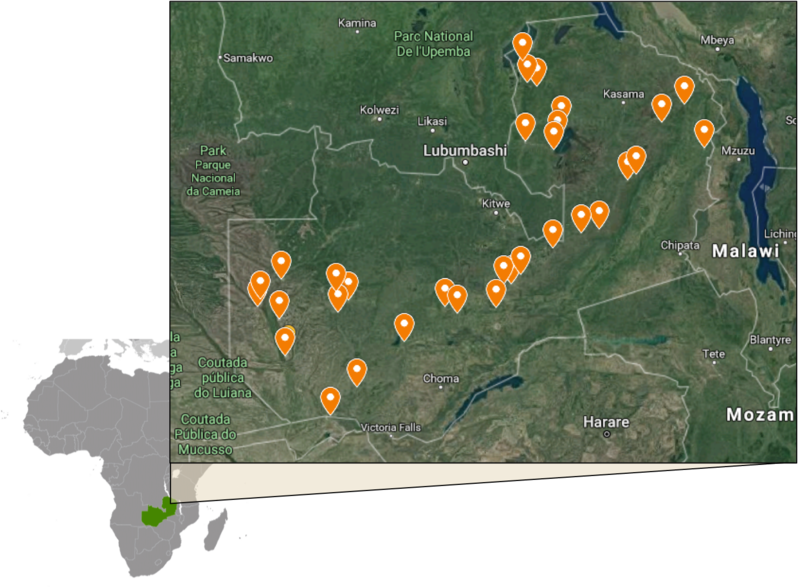 Then, in just under two weeks, we successfully installed UAMs at 10 hospitals across Central, Luapula, Muchinga, and Western Province--leveraging a mobile simulation package and regional training centers in Kabwe and Mansa. Assembling training teams of at least one anesthesiologist, one nurse-level anesthetist, and one certified BMET, we were able to provide a robust training for each hospital--in their own setting. Each installation included at least two days of on-site product refreshers for new users, simulation and live-case training using the UAM, and technical orientations for hospital support staff.